The Alliance of Progressive Labor has been campaigning hard for the promotion of labor and human rights of migrant workers in Hong Kong and yet migrant workers have been continuously denied the right to enjoy a fair share of return on their labor. Following the 1997 financial crisis on the Hong Kong economy, the Hong Kong government imposed two wage cuts – HK$190 in 1999 and HK$ 400 in 2003, bringing down the minimum allowable wage (MAW) from HK$ 3,860 to 3,670 by 1999 and HK$ 3,270 by 2003 and 2005. Through the sustained campaign, the Hong Kong government increased the salary of FDWs of 50-dollar in 2005 and 80-dollar in 2007, so the MAW now stands at HK$3,480. However, these increases are grossly insufficient to recover previous wage cuts. For the workers, HK$ 3,480 is not enough to improve their conditions and sustain their families back home. FDWs contribute over HK$13.70 billion annually to the Hong Kong economy. Yet, in spite of these significant contributions, FDWs are among the lowest paid workers along with other low paid local workers in Hong Kong. FDWs are especially vulnerable to abuses – suffering long and unregulated working hours, ill-treatment and discrimination in a society with a booming economy. 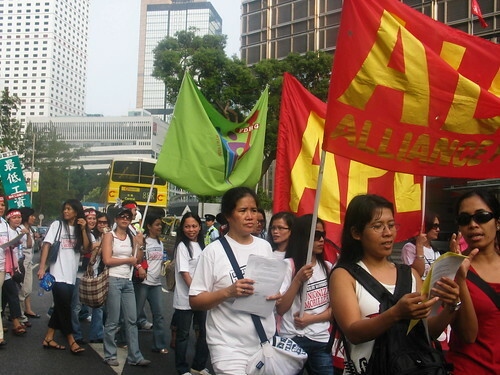 The APL and its Filipino-based “Alliance for Wage Increase” (ALL WIN) link with other migrant workers’ organizations and trade unions in Hong Kong to join the campaign for a minimum wage legislation that will guarantee a minimum wage for all workers. Further, the migrant workers reiterate the call on the Philippine government to amend the POEA (Philippine Overseas Employment Association) guidelines for domestic workers to strictly impose and monitor the “no placement fee policy”, monitor and punish abusive recruitment agencies and abolish training fees for domestic helpers. More importantly, they call on the Arroyo government to stop political and trade union repression in the Philippines and instead concentrate its efforts to provide full employment for all Filipino workers. After all, only a democratic and a prosperous society can stem the tide of poverty-induced Diaspora of Filipino migrant workers! October 28, 2007 in statement. “Domestic work is work, not slavery”! “Domestic workers are human beings, not commodities”!